I love mangoes. But I hate dealing with them. In particular, the pits are a complete pain to remove. Once removed, you then have to deal with getting the flesh off the skin. A slimy, messy, business, at best. At left is the OXO Good Grips Mango Splitter . You hold the fruit upright, place the splitter with the slightly oval shaped blade on the end, and push down on the excellent handles (as the brand name correctly implies)! The flesh will be separated from the pit and only a little bit of the flesh is left at either end. The blade is slightly flexible, thus rendering the tool compatible with multiple sizes of mango. It really does work! I’m generally not a huge fan of one-use-only tools in the kitchen. Take up too much space. One use only tools have to be damned good to stay around and the OXO Good Grips Mango Splitter is exactly that; damned good at the one thing that it does. I mentioned the mango splitter tool to Wilfredo Sánchez and Ben Holt. Of course, the subject of what to do with a couple of mango halves came up; how do you separate skin from flesh? There are all kinds of methods — use a spoon to scoop it out, cut a checkerboard pattern and turn inside out, etc… They are all messy typically yields small bits of mango, at best, while losing lots of juices. 1. Grab a drinking glass. Any old drinking glass will do as long as the top edge is relatively thin. 2. 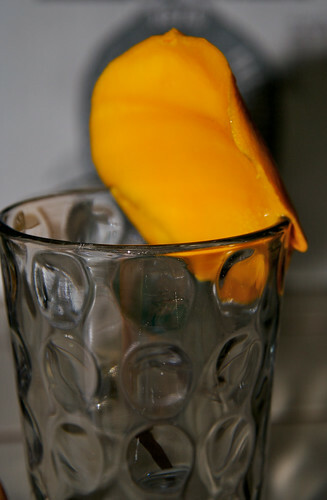 Hold the mango half in the palm of your hand and gently press the edge of the glass into the end of the half, between the skin and the flesh. 3. Slide the half down the edge of the glass, keeping the skin pressed firmly against the edge of the glass. End result? A perfectly skinned half a mango and a mango skin with no flesh left on it. Awesome. In one day, my mango-fu has been enhanced ten fold. Mangos will now be a staple in my kitchen. This entry was posted on Tuesday, March 13th, 2007 at 10:16 am	and is filed under Food, Hacks. You can follow any responses to this entry through the RSS 2.0 feed. You can leave a response, or trackback from your own site. [editor:] This is a splog link. It rips off content from many weblogs and embeds it among ads on its own site. No original content. Obnoxious. Maybe you’re just treating the mango wrong? The way i handle Mangos is not to split them first and remove the pit..
Peel the skin off – which on a ripe Mango works just fine. Then just take a knife and cut the flesh from around the pit. Realy easy for me. No tool needed at all. Olivia (maybe a spammer, maybe not?) makes a good point. Of course, the reach of the web is rather global and, thus, someone, somewhere, reading this will be eating native mangoes. Certainly, I have in the tropics and I would have loved to have known about this when I did. In general, though, yes– it is much better for your health and the environment around you to eat fruits/veggies/meats that are locally grown and, thus, in season.